Translation:Looks are not the most important. I have met this bug again.. 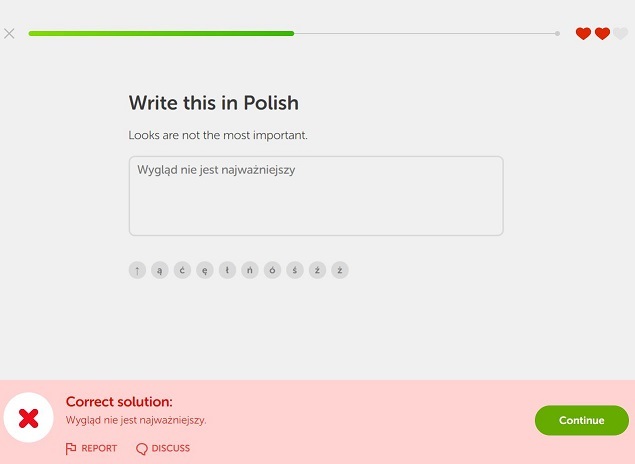 It looks like the duolingo server has some interrupts in its data analyzing and sometimes we all can catch these moments .. Thanks for the screenshot! Again. I passed it further. Ok, today in the evening I noticed there were the longer delays during analysing my answers, sometimes there was not grade about 30-40 sec. It continued short time. Appearance - it is rather "pojawienie" than "wygląd"
"look is not the most important" is suggest, but it is wrong. Looks are not the most important is the closest translation, but is considered wrong. In this case, as a noun, "Looks" is always plural. The only exception is if you are talking about a particular person at a particular time. "I look this look!" You may like how they are dressed at the time. I think this is the phrase, "Looks aren't the most important." Looks is general here, not just how you or anyone else looks at any particular time. Changed the main version to "Looks are not the most important thing."